Alastair Cook marked his 291st and final test innings in fairytale fashion with a memorable century . 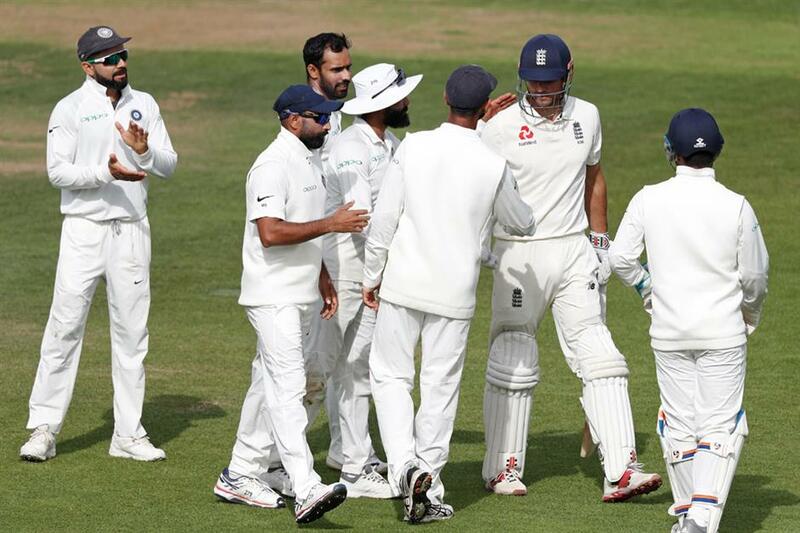 India captain Virat Kohli (left) applauds as England opener Alastair Cook is congratulated by Indian team members after getting out for 147 runs in his final innings on the fourth day of the fifth test at The Oval in London yesterday. Alastair Cook marked his 291st and final test innings in fairytale fashion with a memorable century as England built a 404-run lead over India at tea on the fourth day of the fifth test yesterday. England’s most-capped test player and record run-scorer began the day 46 not out and rolled back the years as he cruised to a 33rd test century before lunch at The Oval. He was finally out for 147, caught behind off the bowling of spinner Hanuma Vihari. Cook’s exit prompted a flurry of wickets with Mohammed Shami bowling Jonny Bairstow for 18 and Jos Buttler lobbing up a catch to Shami off Ravindra Jadeja for a duck. Ben Stokes (13) and Sam Curran (7) took England’s lead beyond 400 with Root declaring the innings on 423 for eight, a lead of 463. Tickets for Cook’s final bow in his 161st test match were being snapped up outside the historic south London ground yesterday. The sizeable fourth-day crowd, the vast majority in their seats before the start, were not to be disappointed. And fittingly his final contribution for his country with the bat was a century against India — the team he scored a debut ton against 12 years ago in Nagpur.